Blue Widow cannabis seeds by Dinafem seeds is a 50% Sativa / 50% Indica hybrid that has amassed a giant following worldwide. Easy on the eye and on the grower, Blue Widow develops with vigor and speed, culminating in a yield of the utmost quality and quantity. Bursting with bittersweet flavor and aroma, Blue Widow will have your taste buds in a twist. While induces a strong relaxing stone. Blue Widow feminized by Dinafem is strong crossing of the notorious White Widow and the Blueberry. This combination has resulted in a potent Sativa dominated strain that deserves its prominent place in cannabis collections everywhere. A big budding beauty, Blue Widow is the perfect strain to grow in a ScrOG set up. She is also very adaptable, vigorously growing outdoors - thanks to her resistant nature to mold and cold. Heavily influenced by Blueberry genetics, Blue Widow develops a nice purple/violet hue in colder conditions. A stunning spectacle that'll leave you lost for words. Truly a rich delicacy, Blue Widow boasts strong genetics. In turn, she emerges as a fast flowering (50-55 days), easy-to-grow specimen, yielding enormous mounds of high quality cannabis. Grown outdoors under optimal conditions, Blue Widow will see growers receive in excess of 1100g per plant of sumptuous weed. Indoor cultivation also breeds an abundance of bud too. On average, effective indoor growth will see grower receive crops totaling around 525g/m². A substantial haul, by anyone's standards. 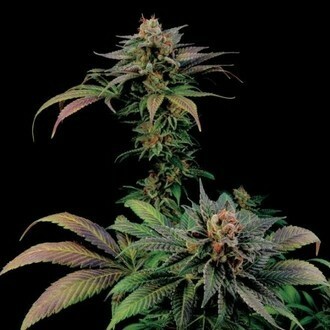 Blue Widow feminized by Dinafem is well known and well loved for her thick, purple nugs and fantastic bubble-gum taste. Nestled in this bubblegum bundle is the authentic flavor of berries, which bring a whole new dimension to the taste. Brimming with THC goodness (12-16% to be precise), she produces a long lasting cerebral stone, that hits you just where you need it - in a very pleasant and gentle way thanks to her moderate CBD levels. Shared among friends she makes for a very relaxing evening indeed. Blue Widow manages to excel in the best way possible, balancing power and performance perfectly. Few hybrids of this nature are able to match what she can do and still retain the same level of quality, not to mention being easy to grow. Yes, i put one of Theseus same Time with one cheese. Blue widow Is quite faster than cheese to grow up. Both grow a tail inside wet paper wich was inside dvd box in 2 Days! Now after 2-3week BW Is 15cm and looking incredible :)! Good seed :)! !